Of the CSA. This is week 19 of 24. The final six deliveries of the summer CSA. I can’t believe how summer just flew by. We are now getting quite a bit of fall veggies in the box. I thought it was interesting that Rodale is now part of our non profit cooperative. They are in Kutztown, not far from most of our Amish suppliers. They do massive amounts of research. It is where I researched spelt. One of our ancient local grains. 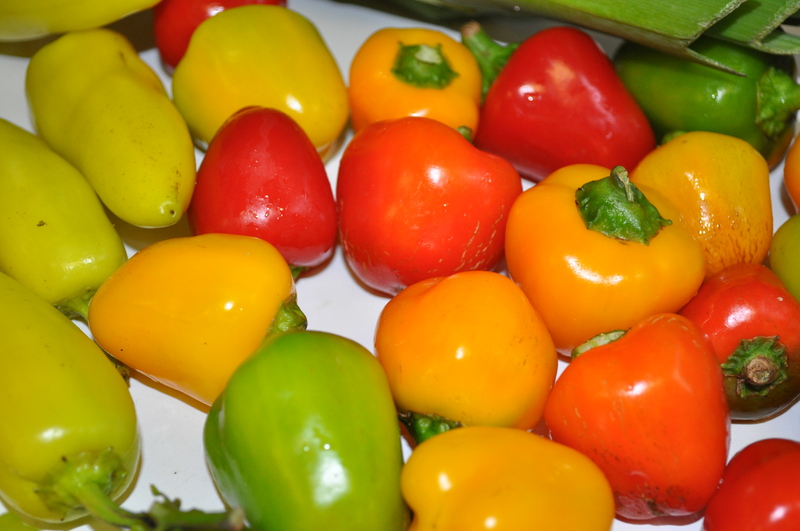 This week I love those baby sweet peppers. I am considering stuffing them with goat cheese, and some habanero jelly, and grilling them. 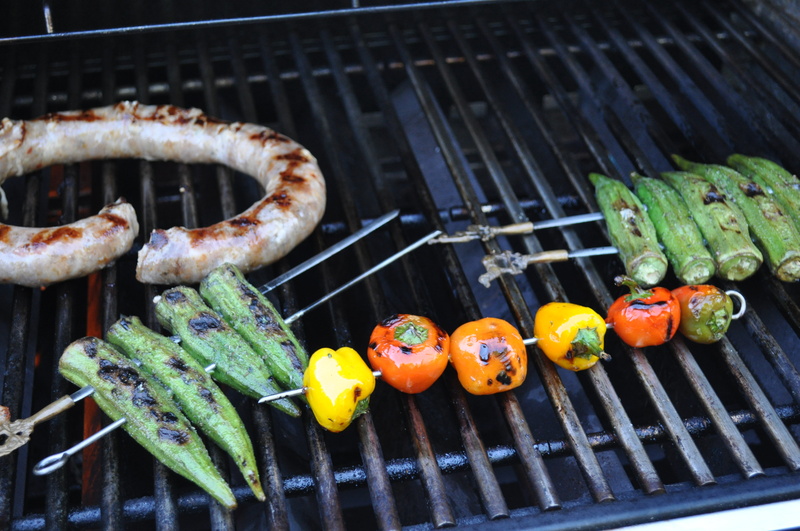 Tonight, though, we just grilled them with a Breezy Willow sausage and the rest of the okra from last week. 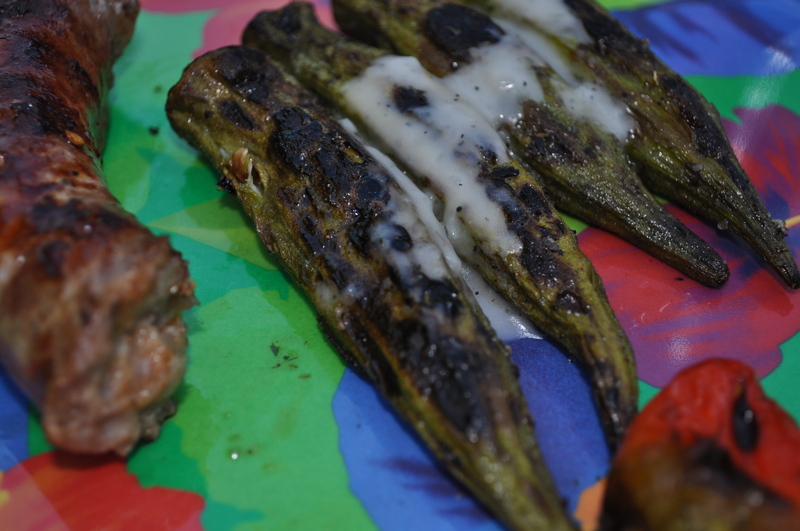 I am seriously enjoying that grilled okra. Love it all charred and smoky. Working on some good recipes for the weekend. The weather will be lovely. Time to really utilize the grill. Posted in CSA, Farms, Food, Locavore, Real Food, Weather and tagged cooking, CSA, farms, Food, foodie, grilling, Locavore, real food, weather. Bookmark the permalink. 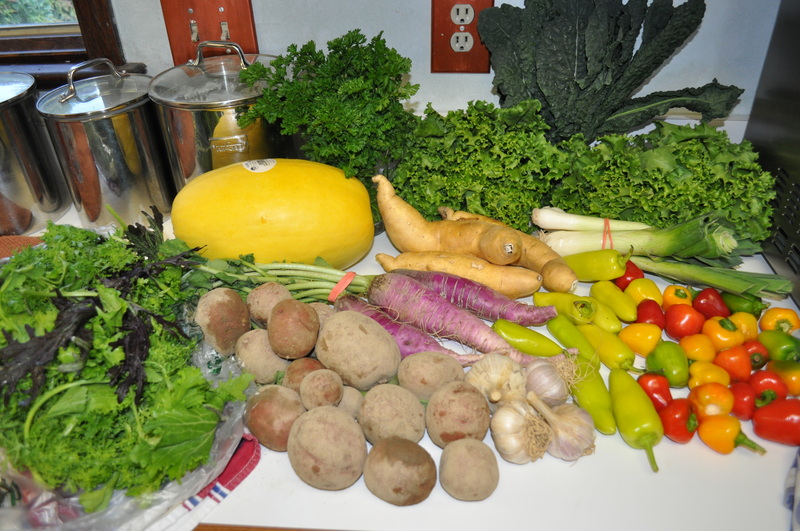 This week’s CSA share from the One Straw Farm contains: tomatoes, cherry tomatoes, kale, collard greens, beets with greens, broccoli, lettuce, and delicato squash. Also, I have an update on last week’s share. The potatoes have lavender flesh. I wish we had a good CSA near me! Looks fantastic! Do you do anything to your okra before putting it on the grill? Tammy, the recipe calls for olive oil, salt and pepper. I brushed some oil on the skewers of okra before putting it on a very hot grill. Mixed olive oil, salt, pepper and thyme in a basting bowl. Used it to baste them while cooking. We did put a little dressing on them at the table, but they don’t need it. The caramelized outer skins have a roasted sweet flavor. These are really tasty. No slimy texture. I LOVE okra but have only tried it roasted. Looking forward to throwing it on the grill.